Your $200 non-refundable deposit should be sent as soon as possible. You can pay in full at any time! ​For the last 22 years, AKJU Team America® has taken a team on a magical trip to historic locations throughout Europe. This year’s itinerary is spectacular and includes an amazing visit to historic Athens Greece! Athens is the city with the most glorious history in the world, a city worshiped by gods and people, a magical city. The enchanting capital of Greece has always been a birthplace for civilization. It is the city where democracy and most of the wise men of ancient times was born. The most important civilization of the ancient world flourished in Athens and is relived through some of the world's most formidable edifices. Then we are off to Dublin for the Irish Cup and additional beautiful sights, food and friendly people. This is a once in a lifetime trip! The Irish Cup competition is open to all styles and has grown from less than one hundred competitors to over 500 each year. During the tournament, you have a chance to become an “All Irish Award"® winner, which is similar to the AKJU "All American Award"®. Another Great Time at the Irish Cup! ​With 19 competitors, AKJU Team America International won 26 Gold, 20 Silver, 7 Bronze, and 1 Grand Championship. AKJU finished second in the Irish Cup for Team Fighting. It was another exceptional performance from the AKJU international team. Congratulations to all! The opportunity is now, take advantage of what life has to offer you. See and do things you have only dreamed about or never thought possible. The A.K.J.U. TEAM AMERICA has all this to offer and more. With the love of God, family and friends, all things are possible. We teach LEADERSHIP, not followers. If you follow a leader don't be afraid to question the leaders decisions. We teach to question what you feel is not right. We teach to keep an open mind and balance things out. We teach that an instructor is a teacher that is always to be teaching and helping. We teach an instructor to earn respect and not demand it..
Over the years Don Madden has a prodigious number of accomplishments. Please click here to see an overview of may of these. How to Play the Game by Don Madden is an excellent view not just on sports but life in general. Please click here to read the entire speech. The A.K.J.U. TEAM AMERICA and A.K.J.U. ALL AMERICAN is a non discriminating Certified Federation recorded with the United States of America State of Ohio, Office of the Secretary of State, which is open to all styles, age and belt rank, giving them the opportunity to travel and compete internationally and still remain in their own Dojo system or Federation. Don Madden	was the head coach of the USA National Karate and JuJitsu Team from 1981 to 1996. The Longest Running and most winning coach In the USA. 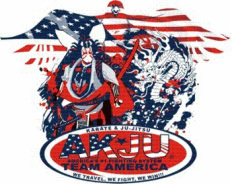 No other American team wins as much as the AKJU Team America/El.